A very scary horror film about a deserted hotel and the way isolation and “cabin fever” cause the caretaker to go insane. A hauntingly creepy movie, The Shining is the horror movie that is composed of the most basic, stripped away parts. a man, his wife, and his child are locked away in a hotel for the winter. They have accepted the job of caretakers for the hotel. There’s just one problem. there is a something wrong with this hotel. A previous caretaker killed his entire family here. 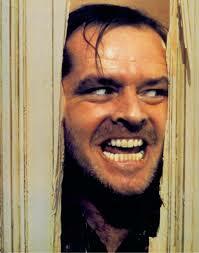 We watch as Jack Torrance, our new caretaker, follows down the same path. First it’s a dream that brings on halucinations. Pretty soon it gets worse. Watching how one thing leads to the next here is pretty cool. The movie itself is so well-put together, with spine-tingling music and long isolated tracking shots, that in many ways this is more of an experience than just a film. The result is another masterpiece for director Stanley Kubrick. The Shining is an extremely creepy and horrifying movie. It’s one of those films that are more psychological than it is full of gore or visual scares. That’s because other than one quick murder, most of what happens here is watching the mental deterioration and corruptibility of a family man. Director Stanley Kubrick takes this story about an abandoned hotel and makes it into the story of a legend and a spirit that lingers in those empty halls. The movie opens with a shot of moving right over a lake at rapid speeds and then following a car as it travels on the side of a mountain. We soon see the people in the car, Jack Torrance (Jack Nicholson), Wendy, his wife, and their son, Danny (who is about eight years old.) from here, we get our first screen title, the interview, and are brought in to an office to see Jack meet the man who will be hiring him. This meeting goes mostly according to what one might expect. The owner of the hotel asks Jack why he wants to stay there with his family for the winter. Jack tells the man how he’s a writer and will appreciate the time to focus on his work. Jack asks him why they don’t keep the hotel opened for skiing and the owner tells him about how bad the roads get. Then something unusual happens. The owner tells Jack a story about a previous caretaker in 1970, who was staying up there for the winter with his wife and children, and decided to murder them all. After hearing this horrifying story, which is told with delicate precision by the owner, we move to the other family members. Wendy is talking to a friend, who is also a doctor, at her home. The conversation is about her son, Danny, and how he has been experiencing some strange problems. The woman gets it out of Wendy that Danny started talking to an imaginary friend named tony, who lives inside of his mouth, at the time of his accident, where he had to miss school for a while. And the details of the accident come out as well, with jack being drunk one night, coming home, seeing that Danny scattered all of his papers, and dislocating the boy’s arm. That was the last time Jack had even a drop to drink. Now we move to the final day of the hotel being in operation before it closes down for the winter. Jack and his family have just arrived and are being shown around by the owner. We move around the grounds with them, often with a tracking shot that really shows us the layout of the place. This is important because nearly the whole movie will take place in this hotel, and we need to know which room leads to which and so on. It’s kind of like clue in that way. The location is so important to the story that knowing where everything is makes a huge difference. We meet the head chef who sits Danny down at a table in the kitchen. There is something unusual about this man, which becomes apparent right away when he calls Danny, “doc.” this is the nickname his parents call Danny, only there’s no way that this chef could have known that. When it’s him and Danny, alone at the table, we learn that he and Danny both share a special ability. They can hear each other’s thoughts and words without either one of them speaking. The chef does it again with offering Danny ice cream, before he actually says anything. The chef explains to Danny that this gift is known as “the shining,” and that people who have it can see things from the past. He also mentions that some pretty awful things happened right here at this hotel, long ago. Once the hotel is cleared out and it is just jack, Wendy, and Danny, the fun begins. Jack has already come off like a bit of a jerk around his family, but nothing compares to his first reaction to his wife, once they are finally alone. She offers to bring him sandwiches and he freaks out on her about not interrupting him when he is working. She leaves him alone after that, until one day when he is having a terrifying nightmare and Wendy comes running in to wake him up. Jack tells her that in his dream, he killed both her and Danny. It gets worse when Danny shows up in the room, covered in bruises. Wendy blames Jack. He doesn’t remember doing anything, and goes off strolling the grounds. Jack ends up in the ballroom, sitting at the bar by himself. Suddenly he begins to hallucinate, and there is a bartender there, pouring him a drink. Wendy shows up a little bit later with a story about how Danny told her there was a woman in room 237 who did this to Danny. Right now, Jack has had his first experience with the spirits of this place. It came to him in a dream, and the proof that he was starting to hallucinate was the bartender. His next experience comes when he goes to investigate the room that Danny spoke about. Jack goes into room 237, and indeed there is a woman there, in the bathtub. She stands up, comes over to jack, starts to kiss him, and then turns into a much older and falling apart woman. This is the spirit of the place, going after Jack even harder. Now, when he goes into the ballroom, it is filled with people. There is a huge party going on, and this is an indication that he has now gotten much more sucked up into the energy of the hotel. This time, Jack doesn’t just talk with the bartender, but also runs into that former caretaker, who killed his family. The man tells jack that Danny is attempting to contact an outside party and bring him here. Jack says he will put a stop to it. This conversation is the breaking point where jack officially changes. From here, there is no turning back. His relationship with Wendy is quickly severed when she recognizes he has gone insane and has to lock him in a meat locker. Her moment of realization came when she took a look at what Jack had been typing for the last few days and was horrified with what she found. When Jack gets out of the meat locker, he goes on his killing spree. This is all incredibly scary because of the way it has been built up and slowly executed. The smallest shots of hallways and the features of the hotel are creepy in this movie, due to the long shots of them and the incredible music, which is more like a collection of uncomfortable sounds. Sometimes it’s screeching noises that get louder and louder like a vibrating note, or strange clattering and bangs. It all contributes to the mood and tone. 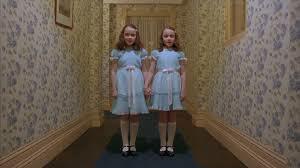 In the hands of Stanley Kubrick, the shining is more than just a horror movie. It is a psychological experience.